The Master Gardener Demonstration Garden in late summer. Photo by Aaron J. Scott. The Master Gardener Demonstration Garden, one of the oldest gardens at the Springfield Botanical Gardens, is located northwest of the Botanical Center building. It boasts many great displays all designed for educating the home gardener and helping them learn to grow. 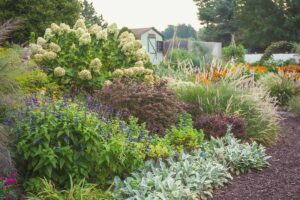 This garden, maintained by the Master Gardeners of Greene County (MGGC), demonstrates how to grow vegetables, sun and shade perennials, native plants, herbs, and various ornamental grasses and it even has a turf plot where various warm and cool season turf grasses are exhibited. We are incredibly grateful to Great Southern Bank for partnering with us and the MGGC in providing financial support for this garden! Through a team approach, the funds have been used primarily to clarify and beautify the three entrances into this garden. Thanks to the generosity of Great Southern Bank and the donations of materials, time and talent from members of the MGGC, these new entry points will be completed early this spring to welcome visitors and students to this highly educational garden area. Additionally, Great Southern Bank, in lieu of utilizing sponsor benefits themselves, chose to support area nonprofits by underwriting the first ever Grow Your Community Garden workshop held on March 1st. 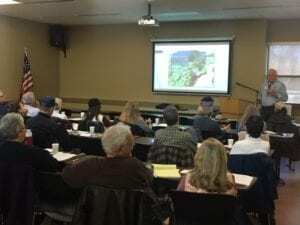 Nearly 30 individuals attended to learn from the research-based expertise of the University of Missouri Extension and from individual master gardeners experienced with growing their own successful community gardens. 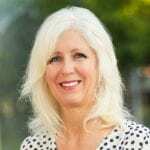 Lisa Bakerink first served as a Friends of the Garden board member before being elected president of the board (2013-2015). She was hired as the first Executive Director in 2015. Memberships benefit the ongoing maintenance of the Springfield Botanical Gardens. Financial support for Friends of the Garden benefits and enhances the Springfield-Greene County Park Board’s commitment to the Springfield Botanical Gardens. This partnership keeps the majority of attractions free for residents and visitors.